This is a great hike if you want to stay away from the crowds. There is only space for three cars in the parking lot off of SR 900. 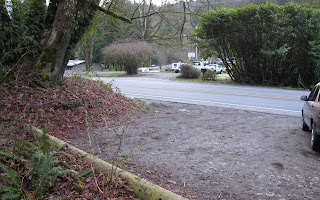 The lot is located after the Talus intersection and before milepost 20 on SR900. The hike is a basic lollipop, with the first mile of the hike being almost all uphill gaining about 600 feet from the start of the hike. 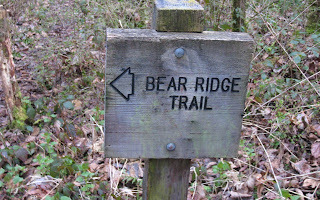 At the beginning of the hike, there are a couple left turns to keep on the Bear Ridge Trail. These are well marked. Since it was March, the forest was pretty barren, which provides for some interesting views normally hidden by dense brush. I should say there are no real "views" on this hike, but there are some nice filtered views of Tiger Mountain when you get up above 800 feet. 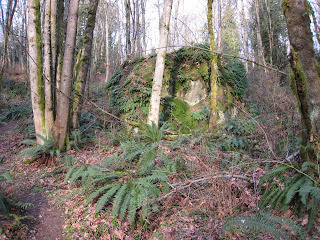 The Bear Ridge trail is the only way to get to "Fantastic Erratic" Glacial Boulder. Its a nice place to stop and take a break along the way. As you continue past the Boulder, you can see back toward Tiger Mountain for some nice sunrise views, if you start early enough. 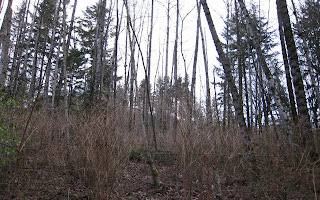 The Bear Ridge trail meets with the West Tibbetts Creek trail which continues up toward the Tibbetts marsh area of the mountain. The West Tibbetts trail goes up to about 1200 feet, when you turn right on to the Protector trail (via a short connection on the Tibbetts Marsh trail). This 0.3 mile trail seems to be used very seldomly and is fairly narrow but offers some nice hiking with a cool redwood glen walk through. The county trail map shows a look-out point on the Protector Trail, but I didnt see any point -- maybe I missed it. 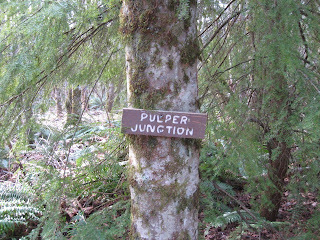 The Protector trail meets up with the Shangri La Trail at "Pulper Junction". 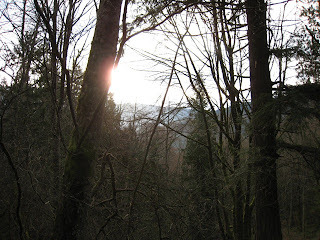 The Shangri La trail is fairly wide and provides some more nice filter views of Tiger Mountain during the winter. The Shangri La Trail crosses a couple feeder creeks during the winter -- not sure these would be active during the summer. Considering it had rained the day before, the trail was very dry for having so much water running on small creeks nearby. 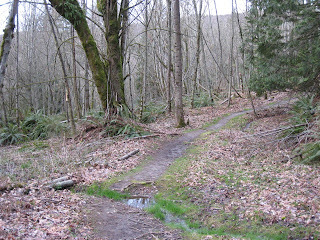 There were only a couple muddy points, but really most of Cougar Mountain's trails are pretty dry even after a winter storm. On the way back you return via Bear Ridge Trail. 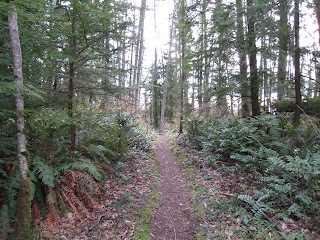 There is an option to return via the West Tibbetts Creek Trail - but I didnt do that on this hike. Overall a very enjoyable and peaceful 2-hour hike on a Sunday morning. The 4.2 mile trek is a good workout for the first mile or so as you get up onto the mountain. Once you reach the Boulder the rest of the hike is fairly easy with enjoyable trails and random creeks which lead to the west fork of Tibbetts Creek. Trail - Lollipop, dirt trail, limited stops along the way. Well marked and maintained.